A former Pentecostal minister and Independent Old Catholic Priest’s conversion story to the Orthodox faith. Where do I begin? I was born and raised in St. Joseph, Michigan, on the shores of SW Lake Michigan – across the lake from Chicago, 61 years ago. My parents were not very religious, in fact, they attended a Methodist church in my hometown. The pastor was a medical doctor and eventually left the active ministry and set up shop as a General Family practitioner. My parents stopped attending church and after that I never remember them ever stepping into a church at all, even to this day. My mother is deceased but my father is still alive and I have never seen him enter a church. So, eventually, around the age of 7 or so, I went to a Baptist church with my neighbors and continued to do so until my teenage years. I then set out to check different denominations, usually joining them, then leaving because something didn’t “feel right”. Of course, our home town had a huge Roman Catholic following, plus my maternal grandmother had been Roman Catholic herself. I remember seeing statues of Mary and crucifixes. Our public school in that day followed the Roman Catholic system of meatless Fridays, usually fish sticks or mac and cheese. So, I became interested in the Roman Catholic faith. But it was not to be at all until years later. I graduated high school, enlisted in the US Army, did a short stint and then married my first husband in Scotland. We settled back in Michigan but only for the summer of 1974, then moved to Arizona. I again, searched and wanted to be Roman Catholic, but my husband was adamant against it. So, I chose the next best thing, the Episcopal church, back then it wasn’t as liberal as it is now. It was the Liturgy that always attracted me to these types of churches. Protestant churches lack any “real” liturgy, rather their services are typified by an opening song(s), prayer, more songs, another prayer, offering and finally – “drum roll please” – the sermon, the main stay. Of course, we are to learn and be taught but these churches continue to make the “sermon” the most important part of the service each Sunday. Yet, to keep the peace, I did exactly that, attending one Protestant church after another. I was lacking though on the inside, my heart longed for the proper worship to be given to God. Another caveat to all of this is that I am a musician, I play multiple instruments and sing, so churches would ask me to help lead music on Sundays. After jumping from church to church, I would sneak occasionally during the week to the local Roman Catholic parish near where we lived. My husband was at work and didn’t know. I longed to be Roman Catholic and felt one day this would happen. In 1983, after the birth of my youngest child, I was attending an Assembly of God church in Phoenix. I loved the people there and the worship was good. One Sunday, the regular pianist was not in attendance and I knew the piece the choir was going to “perform”, so I stepped in and led at the piano. The church eventually asked me to do the music regularly. Then one Sunday, I was supposed to do a special number for the evening service but was pulled aside by the music director and told in no uncertain terms that if I didn’t graduate from the AG college in Springfield, Missouri, I couldn’t even sing on a Sunday evening. My feelings were greatly hurt and I said that’s it. I left that church, then started sneaking to Mass on Sunday mornings behind my husband’s back for a while. Then one day I found a position working at a Bible Christian church, playing the piano again. I loved this church also and the people but disappointment struck in that the pastor left his wife and 3 children for another woman. That did it!! I called a parish that was on my way to work (by this time, I was working full time) and spoke to the associate priest there. We met once a week for 5 months and at Easter in 1986, I was received into the Roman Catholic church. Again, because of musical background, I was soon cantoring at the parish weekly. I loved the liturgy and asked to help different parishes in the diocese. At one point, I was asked to assist with a Byzantine Uniate parish. This was it! The beauty of the Divine Liturgy had captured me. It was totally different than what I was seeing in the Western Rite. But things did not let me stay there as I ended up with other obligations at other parishes in the diocese. In 1989, after 15 years of marriage, my ex-husband left the country and moved back to Scotland with our 2 sons and I was left to raise my 3 girls. I remained a Roman Catholic and continued to work in several parishes over the years. Then in 1997, while my husband, Mark (a cradle Catholic) and I were at a parish, I made an abrupt decision after something a priest had said. I left the RC church for the next 9 years. I began studying and eventually became a licensed Pentecostal Church of God out of Joplin, Missouri minister. I left that denomination as the rules were too stringent and it cost too much money. Besides your regular tithes and offerings to the church, you also had to “pay” for your credentials, which became costly. I applied for independent credentials from a non-denominational ministry and became a pastor for a small local congregation. After a few years, I was called back to the Roman Catholic church, but not for long. Yet, it was when I was called back to the RC church, I began to truly study the early Church Fathers, the Eucharist and other “Catholic” teachings. I would discover the “Independent Old Catholic Movement” in 2008. The beauty of Roman Catholicism without having to answer to Rome. In fact, one of the things that drew me to this movement was that a lot of them ordained women. I always had felt a calling on my life and thought I had fulfilled it in being a Pentecostal/non-denominational minister. In 2009, I joined a group called, O.SS.T. – the Order of the most Holy Mother Theotokos. I had never really heard Mary addressed as the Theotokos except in the council of Ephesus when this was declared. Eventually the archbishop of the group asked me to take seminary studies and in August of 2011, I was ordained a deacon and on June 1, 2012, ordained a priest. In my studies, I had to write a paper on the differences and similarities between the Anglican, Roman Catholic, Orthodox and Old Catholic Churches. Our liturgies did not follow the RC but rather were a mixture of all 4 of the above. When I was ordained, someone gave me a beautiful icon of the Theotokos, which I still have. I also had purchased a couple of icons and a pocket icon of Christ the Pantocrator and Our Lady of Kazan. I still have those also after all these years. One of the people who helped concelebrate my ordination gave me a book on the Grand Duchess Elizabeth of Russia, New Martyr of the Communist Yoke. I read the book and then put it aside for a long time. Over the next several years, I served on and off as a supply priest, tried to have a local parish to work at but with no success. In hindsight, I know I should have never been a priest and that is probably why I failed to fulfill my calling. 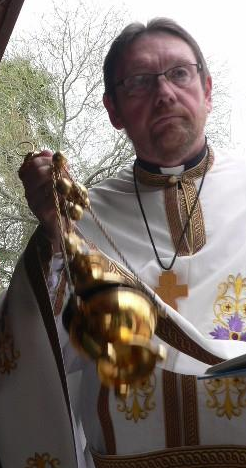 At one point, I was working as supply priest for an Episcopal congregation in Northern Arizona but then the proverbial “rug” was pulled out from underneath me. I know why, I wasn’t “liberal” enough for them and that’s all good and well. I made some very nice friends there and stay in touch with them. Fast forward to July 2016 and I am at a crossroad. I was doing some cleaning and came across the book I mentioned above regarding St. Elizabeth the New Martyr. I was led to read it and I had “liked” several Facebook pages on the Orthodox faith and teachings. One I tuned into was from St. Michael’s Orthodox Church in Geneva, New York and a man named Steve Tobey. He does a daily video called, “The Gospel Minute” and I was hooked. I had looked up several Orthodox parishes and one was in Prescott – St. George’s – but I could not get a response. I need to digress here for a moment, due to some medical issues, I lost my foot and ankle back in 2011 and wear a prosthesis. The problem is that they tear up your pants and skirts terribly. So, I was looking to see if it would be okay if I attended Great Vespers or Divine Liturgy in slacks – I always wear black and dress very modestly. I kept trying St. George’s to no avail and then in August, someone gave me the email address to Fr. Thomas Frisby from Exaltation of the Holy Cross parish in Phoenix, Arizona. I contacted him and then we set up a dinner with him and his wife, Laurel with my husband and me. We did so and I gave Father Thomas some background of above and asked plenty of questions. Due to my schedule at the time, it was several more weeks before I began to attend Divine Liturgy. My first service was on Sunday, September 25, 2016 and all I can say was, “This is where God wants me to be for the rest of my life.” At the end of coffee hour and a wonderful book study, “On the Incarnation” by St. Athanasius, I asked Fr. Thomas if I could become a catechumen. He did not hesitate and so I did the following Sunday before Divine Liturgy. BTW, my birthday is the feast day of St. Athanasius (May 2). I also told all my friends via Facebook that this was what I was doing. Some were shocked, I told them if they wanted to, they could unfriend me. I had a lot of Protestant friends at the time and wasn’t sure how they would react. Some have stayed my friend, some haven’t. Finally, in November, Fr. Thomas said I would be received into the Church on the forefeast of the Theophany, January 5, 2017. My husband Mark came with me and I can’t say how moved I was to be brought into the Orthodox faith. I wrote of my experience in four blogs that were published to Facebook also. Even though my husband for now has no desire to convert, he supports me in being Orthodox and he does attend Divine Liturgy with me on occasion. My parish family is very welcoming to him as well as they were to and still are to me. A side note – as a veteran, I currently belong to the American Legion, a veteran’s service organization. I was considered for Department Commander for the 2017-2018 year. I was handed a month ago, the schedule I would have to adhere to for that year. What I discovered was that I would be gone too many Sundays, away from Divine Liturgy and the Eucharist. This was an easy choice as there was no way I would miss intentionally almost 1/3 of the year to be the commander. I posted on Facebook as well as an email went out to all the posts in the Department (over 130) and the reason why I would not be running. The overwhelming responses (all positive) that I was taking a stand for my Faith proves to me that this is where God wanted me to be. It also has been a witnessing tool to the Orthodox Faith and people are now asking me about what we believe and there is even interest in some of them coming to my parish. For those of you women who think that you have a calling on your life to be a minister, priest, or other clergy, it isn’t necessary. I wish I would have found the Orthodox Faith – the TRUE faith – years ago. I probably would have never been a minister or priest. Do I miss what I did? No! I am fulfilled as a woman in the Orthodox faith. We have a place in the Church that is rich and Christ truly loves each of us. I am writing this just days before the start of Great Lent and praying that I will continue to draw closer to Jesus Christ in the time. My journey is continuing and I thank God for the Orthodox Church and for my parish, Exaltation of the Holy Cross as well as Fr. Thomas and Laurel Frisby. So interesting. I never realized that a woman could be ordained a Priest in any of the Church of Rome sects. But I had never heard of the group the writer was a Priest in. Blessings. Sherie I’m so blessed to call you friend and sister! What a beautiful testimony! and not other spiritual bus station! Greeting from Romanian! Thank you. Your trip sounds like a pinball machine. You just kept bouncing until you won! The beauty of it is that you have no doubts and a really moving testimony to give to all of the above and to whom it may concern. God bless you….you have blessed me.